Mercedes-Benz and Aston Martin have recently shown off ultra high-strung Formula 1-style roadgoing supercars. They’re fine. But Toyota’s Gazoo Racing just debuted the GR Super Sport Concept, and it’s better. Instead of being F1-inspired, Gazoo’s “road car concept model” is based off its 24 Hours of Le Mans program. And Le Mans is better than F1. 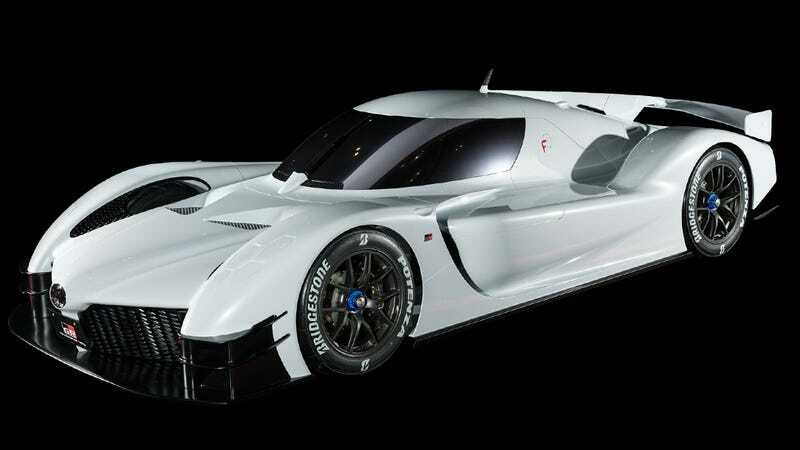 Toyota won’t go so far as to say that the GR Super Sport Concept is a Toyota TS050 LMP1 prototype made street legal. It’s a little more distant than that. “Mostly the same main parts as the TS050 Hybrid race car” is how the company puts it in its English-language press release for the car, unveiled today at the Tokyo Auto Salon. Yes, yes. I want a V6 trained in actual battle. I need that. The wheels are 18s, but they’re also 13 inches wide to fit 330-section tires all around. Grip is on another level. Gazoo showed off the bare chassis of the concept and you can see how close it is to what endurance race car drivers snuggle into to run tracks like La Sarthe. Also there’s lots of gold. Most importantly, it has the most desirable feature in modern automotive design. Of course, I’m talking about roof-exit exhausts. Amazingly, Toyota’s Gazoo racing team does send off a number of limited-run production cars for public consumption. Usually there are between 100 and 200 Gazoo vehicles sold every year. Last year the world got 100 tuned GT86s, the year before that 100 tuned Toyota Mark Xs, 200 turbo Vitzes before that and 100 sueprcharged ones a year before that. This year Gazoo has branded Nürburgring-tuned Yaris hot hatchbacks. But really, we need this for the roof-mounted exhausts. The Porsche 918 has them, this car has them, and Toyota absolutely needs to build some of these things. If only to kick Mercedes and Aston and any other F1-inspired car into the trash.